More than a matter of aesthetics, the time to consider balcony replacement more often comes as a matter of safety. Many signs present themselves that should concern the homeowner. There are enough annual balcony collapses to put everyone on notice of just how important the health of their balconies translates directly to their safety. An essential part of replacing a balcony directly concerns waterproofing. Some of the signs that it is time to replace the balcony should come as obvious. Even without having an annual inspection by a qualified expert, some signs come with bells and whistles. The first sign is creaking. When your deck begins to creak every time you step out on it, then you know something is wrong. Any sound that suddenly appears that wasn’t present when the deck was new is a strong indicator that the deck’s integrity is likely compromised. Wobbly rails is another obvious sign. Once the railing begin to move, it becomes a clear sign they need repairing or replacement. 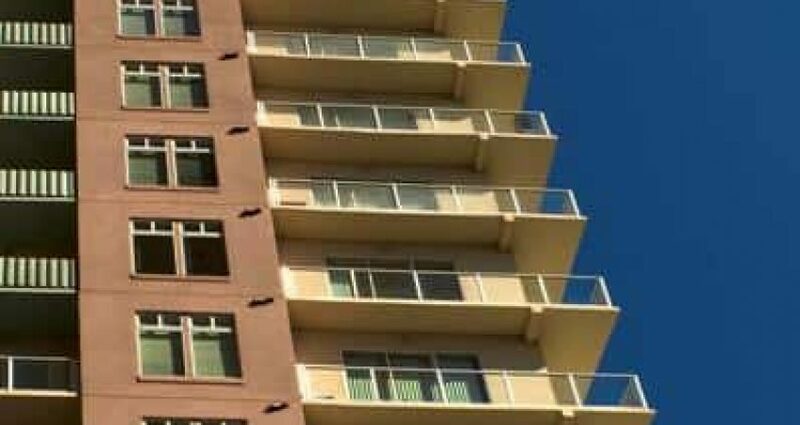 Visually, signs of cracking, splintering, loose nails, or screws, and even displacement of the support posts from their cement base gives fair warning that some part or the entire balcony needs replacing. Unseen, and the most treacherous, is the wood deterioration and decay. In some instances, balcony failures resulted because of moisture intrusion during the construction process — proving the power and need of proper waterproofing. This is where inspectors are important. They can look to see if the ledger, support beams etc. have continued viability and that moisture is not accumulating. Plus, they can observe if the waterproofing i.e. flashing etc. is present to protect the wood. If any factor compromises the supporting structures, allowing moisture build up, then the balcony needs retrofitting or replacement. When replacing a balcony, the prior construction and waterproofing techniques become apparent. Many of these techniques run contrary to current building codes. Also, moisture build up is observable giving the owner the opportunity to check the other support mechanisms like ledgers and adjoining walls to see if there is moisture and that these structures remain unaffected. Once the construction begins, then focus often moves away from just the construction techniques for building a balcony. Employing flashing, membranes, ducts and other waterproofing devices takes precedence – becoming more important than the balcony’s construction. Consideration is given to the material used to build the deck. Different waterproofing systems require different techniques and systems to meet the challenges presented by the use of varying materials. Contact us, Pli-Dek Systems, to learn more about waterproofing systems and when your balcony may present as a risk and need replacing.